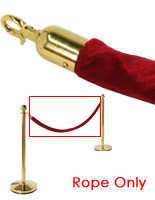 These Stantions Include a Bright Red Velour Rope! We Provide these Stantions with Traditional Styling to Suit Upscale Environments! 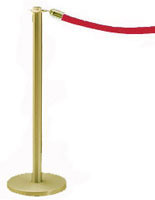 This Traditional Crowd Control Stantion is Polished Brass and has a 6 ft. Cardinal Red Velour Rope. 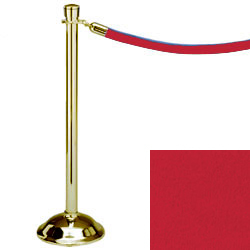 Included in the price is one Polished Brass Traditional Post along with a 6 ft length of cardinal red velour rope which includes the necessary 1 1/2" Snap Rope Hooks in the matching Polished Brass finish. We have done the research and have determined that these are the nicest traditional posts you will find on the market. For the last rope in your series, you will need either a Post without a rope or a Wall Plate Hook. 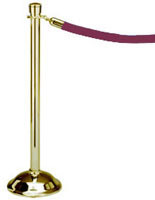 Both can be seen in the related products section at the bottom of this page. 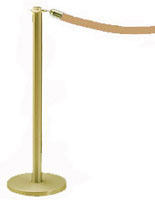 The post is 38-1/2" High with a 11-1/2" Round Base. It weighs 22 lbs.